Catching a group of wild hogs like these moving out of their feeding grounds early in the morning can make any hog hunter happy  one problem though, which one to take? It is just a week away until one lucky WesternHunter.com e-mail list member will be the winner of a guided wild hog hunt. That's right, all you have to be is a reader who has joined our weekly hunting information e-mail list. The drawing will take place on Tuesday, February 15th from among the e-mail list members. If you have not joined the list by supplying us with your e-mail address, you are not in the drawing. Let's talk about the hunt. This will be a guided wild hog hunt for one hunter. You will be hunting with guide Mark Williams of Williams Guide Service out of King City, California. 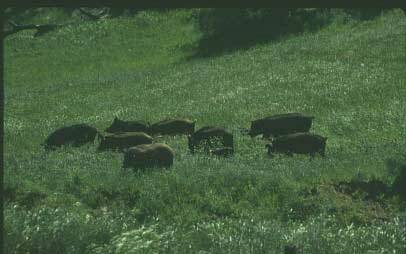 Williams guides in one of the best wild hog areas in California, the Central Coast, just one hour south of Monterey. Last weekend Williams guided four hunters and they all took hogs. This is not uncommon for Williams. The winner has until June 1, 2000 to take this hunting trip. The winner can use rifle, pistol or bow. The hunt will be for two days, if needed. Many of Williams' hunters are able to take their hogs in just a single day. Additional hunters can accompany the winner at Williams' regular price. Williams will guide the winner on private land and when the hunter bags his hog, Williams will field dress it and have it transported to a local meat locker or to the hunter's vehicle. The winner will be responsible for their hunting license, tags, transportation to and from King City, food and lodging. Cross your fingers because this will be a great hunt for some lucky WesternHunter.com reader. If you don't win, you can book a hunt with Mark Williams by calling him at (831) 385-6321.